Please note that the content of this book primarily consists of articles available from Wikipedia or other free sources online. 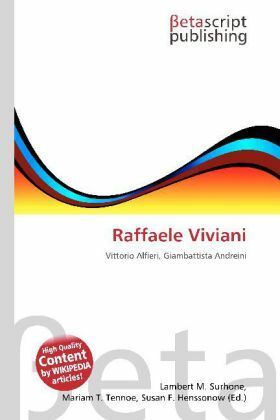 Raffaele Viviani (10 January 1888, Castellammare di Stabia, Province of Naples 22 March 1950) was an Italian author, playwright, actor and musician. Viviani belongs to the turn-of-the-century school of realism in Italian literature, and his works have to do with seamier elements of the lives of the poor in Naples of that period, things such as petty crime and prostitution. Critics have termed Viviani "an autodidact realist," meaning that he acquired his skills through personal experience and not academic education. Viviani appeared at the age of 4 on the stage and by 20 had acquired a solid reputation as an actor and playwright throughout Italy. He also played in Budapest, Paris, Tripoli, and throughout South America.